Meerut is the ground zero of India's sports goods business. Things are changing here, away from cricket, towards a rainbow of sports. As the Delhi-Meerut road approaches the Hapur Circle, it gets narrower. Customers queuing up outside the Jagan Chhole Bhature stall spill over on to at least half of the available road space. Amidst the crowd and the chaos, a group of children suddenly comes running out from the left flank, chasing a football. There is neither a goalpost nor a goalkeeper in sight, and all the children are running after the ball in the same direction. But rules don’t matter in the gali. In the very next by-lane, another group of children is busy playing kabaddi. Lest we forget, that all-consuming sport—cricket—also makes an appearance, but in some distance and with less fanfare. Rajiv Saini, the owner of Venus Sports, doesn’t find this surprising. “In the last couple of months, we have sold more volleyballs and badminton rackets than cricket bats," says Saini, whose sports goods manufacturing and wholesale unit is nestled in the heart of Meerut’s Suraj Kund Road area. At the Kailash Prakash Stadium nearby, Saini says people can be seen practising even kabaddi these days. Last month, a project was cleared to build a model shooting range at the stadium. According to local media reports, badminton players have been complaining about the lack of courts in the wake of an increase in the number of participants. “Ten years ago, who knew kabaddi and badminton?" Saini asks. In the last decade, with the rise of the league format in sports such as kabaddi, football and badminton, and the sudden burst of medals in athletics, non-cricket sports have started gaining momentum. And Meerut lies at the heart of this nascent transformation, due to its unique place in the Indian sporting goods manufacturing landscape. The small town in western Uttar Pradesh, about 70km northeast of Delhi, is home to about 1,250 registered and 2,000 unregistered sports goods manufacturing units, providing direct and indirect employment to approximately 70,000 people. Meerut accounted for almost 30% of India’s total sports goods exports of ₹ 1,079 crore last year (FY 2017-18). The emerging new business opportunities are already apparent. “Who is the second biggest sports celebrity in India today after (Virat) Kohli? It is P.V. Sindhu," sports historian and author Boria Majumdar had told Mint in an interview earlier. “Cricket became cricket because of the wins. If India wins a gold medal at the 2020 Olympics in badminton, you’ll see what that sport can become," he added. The Sports Goods Export Promotion Council (SGEPC), a government-sponsored organization whose aim is to spur export of Indian sports goods, has already begun to sense overseas opportunities as Indian athletes begin to acquire global profile. A spokesperson for the council said that the recent success of athletes such as Swapna Barman (heptathlon), Tajinderpal Singh Toor (shot-put) and Neeraj Chopra (javelin thrower), who all used Meerut-made equipment, is a victory for the sport goods makers of the city. “Cricket is big, but the sports goods industry is moving towards a wide variety of other sports," the spokesperson added. The numbers are revealing. 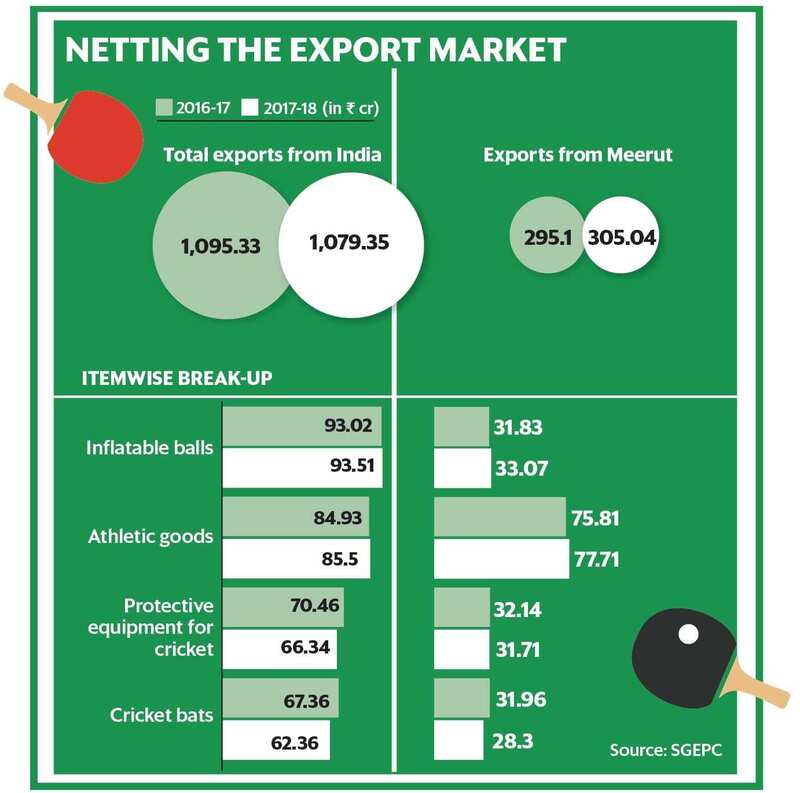 While the export of cricket bats and cricket-related protective equipment from Meerut fell last year, the export of general exercise equipment went up by a modest 2%. Exports constitute a significant chunk of the business. Puneet Mohan Sharma, the president of All India Sports Goods Manufacturers Federation, pegs exports at 60% of the total business. However, domestic supply is largely undocumented due to the presence of a large number of small, unregistered manufacturers. “Almost 90% of the shuttlecocks are made in small home-based factories that have a turnover of less than ₹ 20 lakh per year, which makes them tax exempt," Sharma says. “Stringing of the badminton rackets or stitching of footballs also happens mostly at these smaller units," he adds. While the Indian domestic market is still difficult to track, almost everyone in the industry admits two significant changes which are underway: There is a shift towards “other sports" and, two, big manufacturers are now increasingly focusing on the domestic market, which seems to have found renewed interest in all kinds of sports. “About two decades ago, sports in India meant only cricket," says Rakesh Kohli, chairman of Stag International in Meerut, which makes table tennis equipment. “What has happened since is that other sports such as badminton, boxing, football have become popular too. They are now growing faster than cricket." Meerut is still home to some of the world’s biggest brands in cricket goods: SG, SS, and BDM, to name a few. “But the number one exporter from Meerut is Bhalla Sports that doesn’t make any cricket goods. They make athletic and training equipment," says Kohli. “Another hugely successful exporter is National Sports which mainly focusses on personal fitness gear." Sharma says sports has become a big thing only in the last 20 years. “If you look back, the middle class’ only priority was to put food on the table in the 1990s. Sports was a luxury. But things changed with the advent of cable TV and the 24x7 news cycle. Sports and athletes got more exposure. People could see how even a farmer’s child could become national hero," says Sharma. Slowly the perception began to change. “Salary hikes came thereafter, starting with the 5th Pay Commission. Purchasing power of the middle class has increased," says Sharma. “While seven children would play badminton with two rackets in the early 1990s, by the turn of the century, most children had their own rackets." The proliferation of franchise-based sporting leagues also helped accelerate the change in the mindset of an average Indian parent, some of whom now increasingly look at sports as a viable career option. When Mahendra Singh Dhoni attracted a bid of $1.5 million before the first season of IPL in 2008, it made headlines. Nobody would have believed it then that a lesser known athlete from Haryana could garner a ₹ 1.5 crore bid 10 years down the line to play kabaddi. A Deloitte India report in April 2017 estimated that about 1.33 million young Indians were likely to take up sports as their full-time profession by the end of that year. It is hardly surprising then that Indian parents are looking for the best of the equipment for their children. “Ten years ago, we used to make different products for different markets because there was a price factor. Export-quality goods were different from those meant for domestic consumption because of the price point. Today, people want to buy the best product in India too and that is a very refreshing change," says Amber Anand, director at Nelco, which makes track and field equipment. The company makes everything from dumbbells and weightlifting equipment to cricket bats, but the company is best-known for its throwing implements—discus, shot, hammers, and javelins. Increased private sector participation and government policies meant to promote sports have been the other crucial factors behind the increased domestic consumption. The general exercise and personal fitness category has emerged as the biggest gainer of this shift. The Union government’s Khelo India programme, launched in 2017, set aside ₹ 1,756 crore to upgrade fitness equipment and set up open gyms in public parks. Ashish Mahajan joined his family business in 1993. The same year, he visited ISPO, Munich, the world’s largest multi-segment trade fair for the sports business. “What I realized was that there was no point in taking the same product to global markets," says Mahajan, 43, CEO of the family-owned National Sports. Along with brother Kunal, Ashish forms the third generation of the family heading the company. “What I saw at ISPO was that many Chinese companies were showcasing smaller accessories such as marking cones that no one else had," recalls Mahajan. “These were considered such small parts of the business that no company was actually focusing on them. Most companies were focused on primary equipment." But these small, almost ancillary equipment, had the greatest growth potential. So, upon his return, Mahajan spearheaded the development of a whole lot of soccer accessories and training equipment that were highly popular in Europe. “The growth is higher in accessories because they are not bound by any segment," explains Mahajan. “Whether you had a good season of cricket in England, whether you play hockey, football or cricket, it doesn’t matter. You will still need training equipment. And then, there is a huge emphasis on personal fitness across the world today." The Deloitte India study pegs the fitness industry in India at $1.1 billion. “The market penetration rate in India is as low as 0.5% and is mainly fragmented with majority of the market dominated by unorganized and independent gyms," says the study. “The health and fitness industry in India is poised at an inflection point and is chiefly driven towards wellness, fitness, presentability, and confidence." All of the above reasons have made personal fitness and training equipment business as one of the fastest growing segments. The segment makes up for more than 50% of the business for National Sports. “Out of the 1,400-odd products that we make, about 400 are training equipment, such as ladders, hurdles, rubber resistance tubes," says Mahajan. Then, there are sports accessories such as goalposts, nets, cones, training bibs, etc. The company started selling in India just two years ago after realizing the potential in the domestic market. SGEPC projections show that the industry will grow at 8% in the current fiscal year, but Kohli bets it could see strong double-digit growth. “Till now, the focus was entirely on exports, but the domestic market has opened up another channel to scale up operations. We are struggling to cope up with the demand," he says. “If we can just meet the demands here, the double-digit growth is the minimum we can expect." Challenges still remain in this unfolding Indian dash towards a sizeable pie in the global sports goods business. Mahajan says the biggest of them is the lack of infrastructure. “If the infrastructure could be good enough to invite more industries to set up a base in Meerut, we would also be able to retain talented workforce, which is increasingly moving to Delhi and Noida in search of better opportunities," he says.